Enjoy Childlife First Defense Immune Formula . 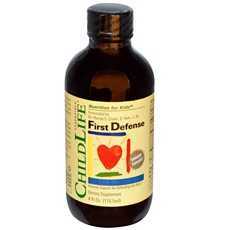 Childlife First Defense Is A Unique Formula That Supports Your Child's Natural Defenses And Immune Strength. Health Tip: For Stimulating Natural Immune Responses And Defending The Body. When Needed For Immune Support, Use Daily At The Recommended Dosages. For Ongoing Maintenance, Use Once Daily. Childlife Uses Only The Highest Quality Ingredients. (Note: Description is informational only. Please refer to ingredients label on product prior to use and address any health questions to your Health Professional prior to use.